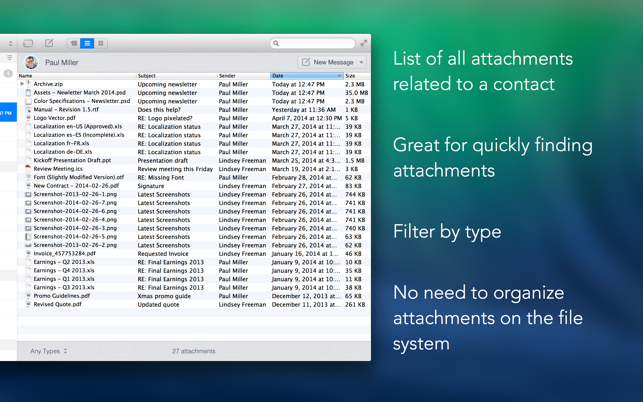 A completely new way to organize your emails. 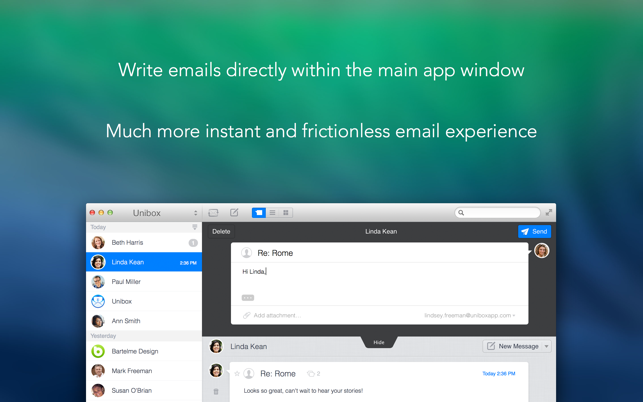 Unibox is an email client that groups your messages by sender. This way your emails are organized automatically and you always find what you are looking for. 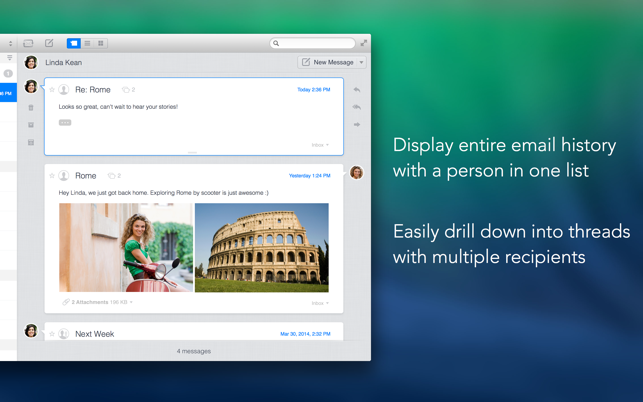 Instantly compose your messages without opening new windows. Easily drill down into a conversation view with multiple participants. Show only messages that are unread, starred, have attachments or were sent by people from your address book. View messages and conversations across all your accounts. Focus on single accounts or folders when necessary. Quickly find documents and files you exchanged with other people. 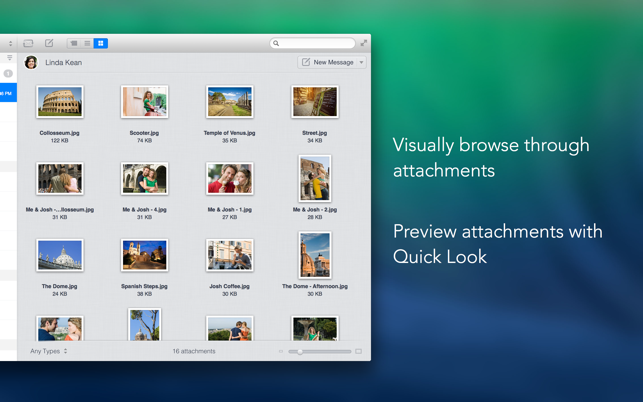 Visually browse your attachments and images. Preview attachments without launching external apps. Use multiple identities with a single account, including separate SMTP servers. Btw, Unibox is now also available for iPhone and iPad. Unibox is something I have used for the past 3 years… I can’t stand the apple mail app, and prefer Unibox, but HERE is why I give it only 2 stars. Unibox was buggy as all getout and I stuck with it. Now, it works and is stable, but the occasional issue comes up and it seems that the developers are always confused as to how their own app works. Finally, I was hacked recently and after hours of working on it, all of my emails and all apps (this is 20-30 accounts) have all been changed except Unibox. The reason is that Unibox claims to use the servers themselves, but this isn’t true because all of the email passwords were updated. 24 hours later it doesn’t work. Delete and reinstall, and it doesn’t work. This is a serious security issue for myself and the people trying to track down the fraud. I have other speculations, but will just suffice to say that even though I like its functionality I don’t think it’s safe to use. Developer: You need to make this app work right. Simple talk from someone who has used your app profusely. The app seems to just lack very common sense solutions to it’s problems. Unibox is totally unique. With other email clients, I felt like each email represented a thing demanding my attention or a task to be done. With Unibox, the focus is on the person who sent the email. When emails come in, I see them as clients and persons I am in conversation with and whom I want to serve. I like how all the conversations with that person are linked, so looking back on previous conversations is made easy. In the Unibox view, I can also see emails that I sent out and am awaiting an answer. I like that reminder, otherwise I may forget that if I don’t get a response, I need to follow up. Finally, I like the attachment view, so I can quickly and easily spot an attachment without having to reopen old emails. Works for me! 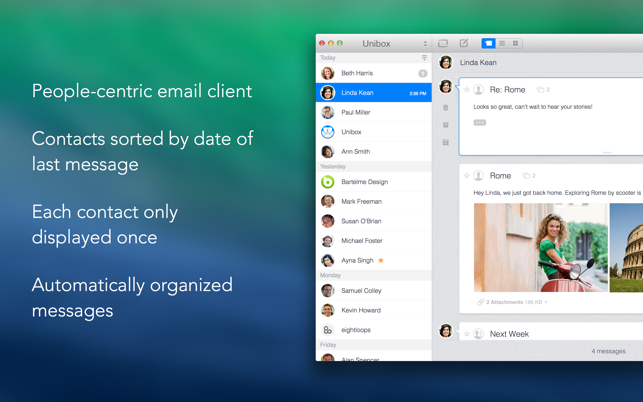 I love the concept behind Unibox, with some tweaks it could be fabulous. 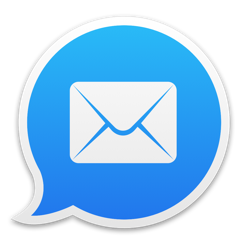 Like the option to have group emails show up as an identity rather than having each response show up under a serperate person (this makes it imposible to follow multi contact conversations as you have no clue who’s response goes where in the conversation). Also little things like not having the delete, achive, spam options follow you down an email when you scroll, or the fact that the delete key on my keyboard won’t delete a message. My real complaint though is with support I have contacted them a couple of times and I get unhelpful and snide sounding responses. I wonder if english isn’t thier first language and maybe the communication don’t come across as intended. Be warned that I have been unable to recive messages, and to send at times when I can access my email via other means with out a problem. Over all I realy like what Unibox has going for it and I would love to see it improved and made more stable. I sugest giving it a try.